Last week, we published a list of websites for sharing photos with friends and family. Of course, you can also share your photos by emailing them, but many email services impose a limit on the size of files you can send. 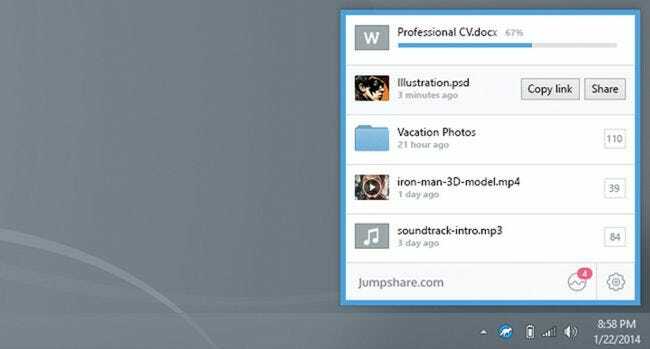 Jumpshare lets you send files up to 250 MB with their free account, but if you upgrade to their paid plan you can send files of any size. You simply upload a file, and they give you a link to share the file. Unlike all the other competitors, they have a really nice application for both Windows and Mac that lets you easily share files, folders, and documents. 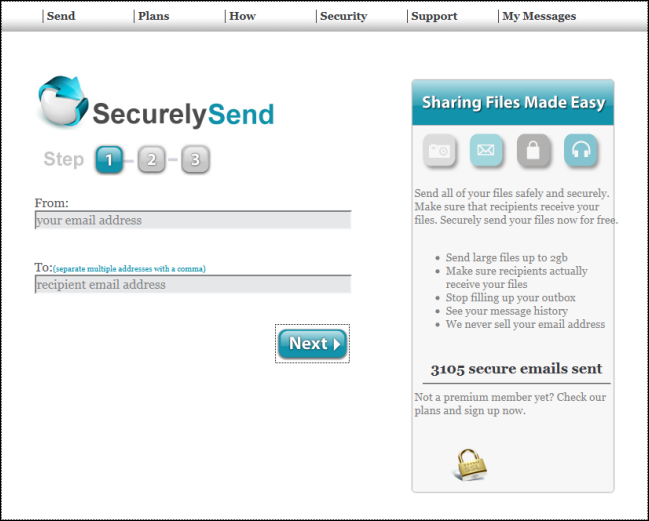 Securely Send allows anyone to send large files safely. Sending files is as easy as entering the email address to whom you would like to send files, attaching the files that you would like to send, and clicking “Send It.” Securely Send takes the hard work out of sending large files. You can be confident that your files have been received. A free account allows you three sends per month and the maximum file size you can send is 200MB. There are Basic, Standard, and Premium paid plans that allow you to send more per month and raise the maximum file size allowed. 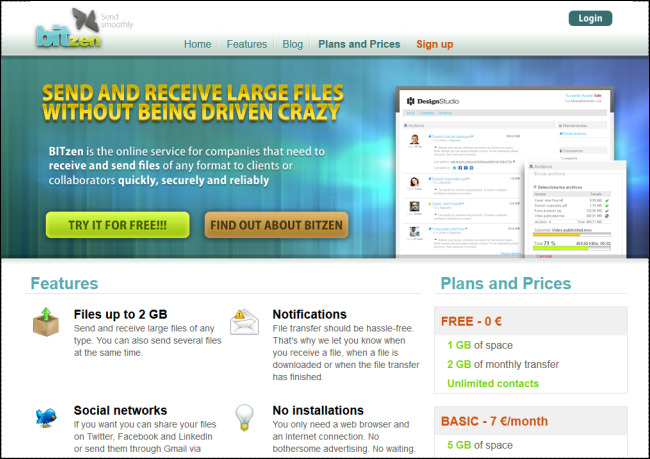 BITzen is an online service that allows you to receive files from and send files to others quickly, securely, and reliably in any format. The service is aimed at companies that need to send files to and receive files from clients or collaborators, but it can also be used by others for personal purposes. You don’t have to install any software to use this service and you will be able to use their service free service almost instantly after registering for their free plan. The free account provides 1GB of storage space, a monthly transfer limit of 2GB, and a maximum file size of 2GB. There are three paid plans also available for users. Most of your relatives aren’t on social networks, and shared folders are too complicated for what they actually want to do: look at your photos. Kicksend was designed just for them. 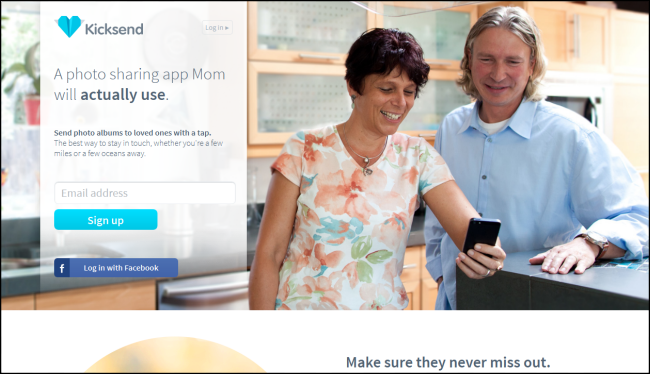 They’ve made it simple enough for Mom and Dad to use without tech support or training. You can also order beautiful, high-quality prints for yourself and loved ones on Kicksend quickly and easily. You choose the prints, they choose the store (CVS, Target, or Walgreens). From your phone to their hands in one hour. Memories ready to be framed and cherished forever. Kicksend helps you free your email inbox and everyone else’s. All your pictures are stored securely on Kicksend, so you can view and download them privately from any device, anywhere, anytime. With millions of registered users in 193 countries and 98 percent of the Fortune 500, YouSendIt is the go-to file collaboration service for both consumers and enterprise. The company‘s online services span from simple file sharing to complete collaboration services that allow users to securely share, sign and access content from any mobile device or PC. The free Lite plan offers 2 GB of storage, five E-Signatures, and a maximum file size of 50 MB. If you need more storage space, a larger maximum file size, or more features, there are additional paid plans available. YouSendIt also integrates with Microsoft Outlook, making sending large files and folders (up to 100MB) as quick as sending an all-text email with no extra steps required. 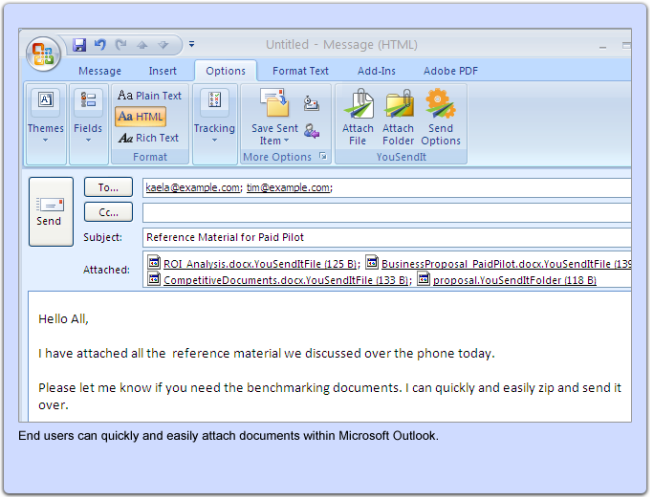 We’ve written about how to use the YouSendIt Outlook add-on. 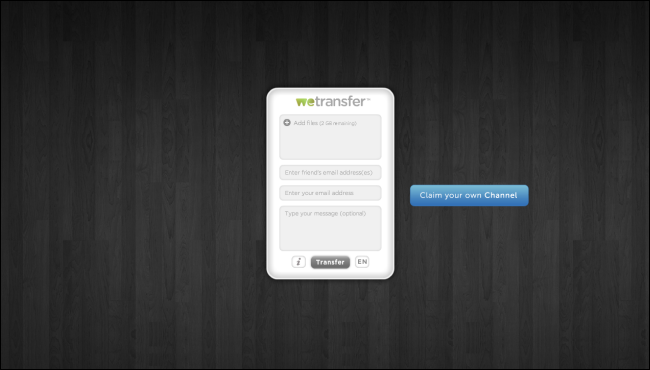 WeTransfer is a free platform for transferring large digital files up to 2GB per transfer. They can transfer any type of file – such as presentations, photos, videos, music, documents and more. There is no registration and the files are available for two weeks. They are supported by advertisements displayed as wallpaper on the WeTransfer site. They also sell WeTransfer Channels that allow you to have your own wallpapers, no ads, your unique WeTransfer URL, personal background in emails, and the files are available for a month, rather than for two weeks. 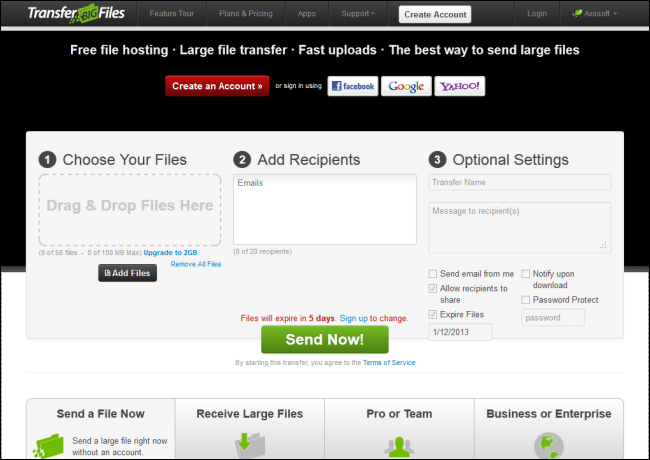 TransferBigFiles makes it very easy to send and share large files that are generally too big to email. It does this by allowing you to upload your file to our servers and it sends a link to a page where the file can then be retrieved by your recipient (or yourself if you are the recipient). You can use the site for free without registering. 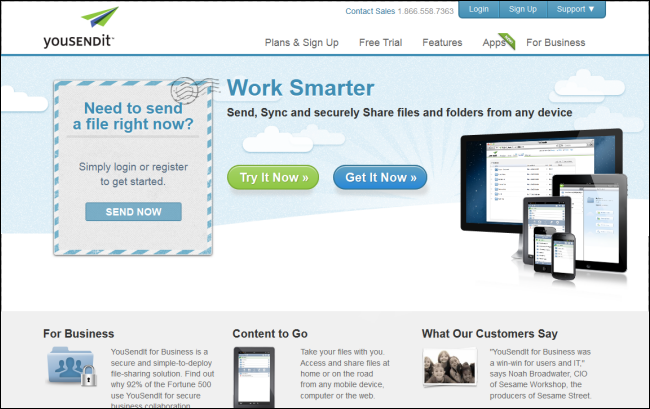 The free account allows you to send files that are as big as 100MB, whereas most email systems max out at 10MB to 25MB. Files are kept for five days with the free account. Premium, paid accounts are available if you want the benefit of the added features, like the personal drop box, transfer history, larger size limit, higher download limit, storage space and much more. 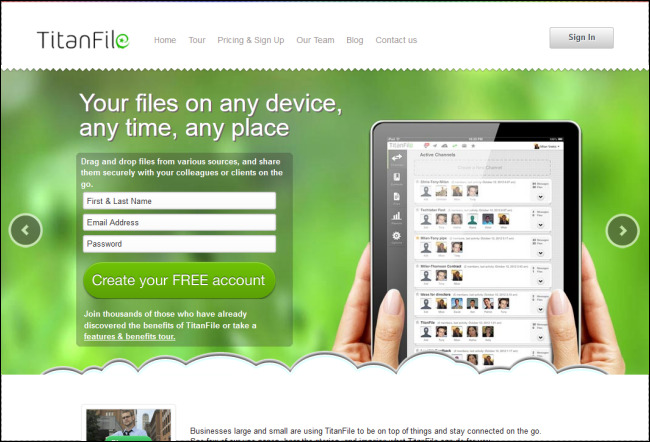 TitanFile allows you to drag and drop files from various sources, and share them securely with your colleagues or clients on the go, using any device at any time and any place. Organize your information around people and common context instead of around files and folders, making it easier and more intuitive to find your files. TitanFile transfers your files over a secure connection and stores them encrypted in a secure facility. Their free Basic plan is good for basic use and supports uploading files of up to 100MB. You also get seven days of an audit trail and five communication channels. There are also paid Professional and Enterprise plans, if you need more features. 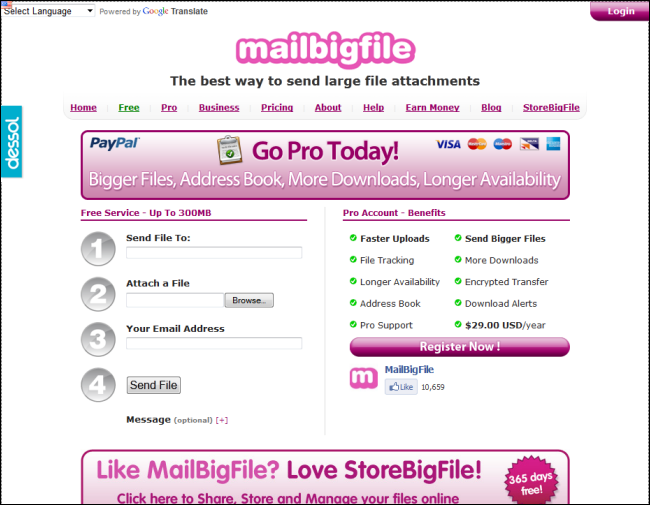 MailBigFile allows you to send large files when you can’t through regular email. It’s web-based, so there’s no software to download, and it’s easy to use. The free service allows you to upload files with a maximum size of 300MB per file. The files are available for 10 days. You can have one recipient per file and each file can be downloaded up to 20 times. There is no permanent storage with the free service. There are additional paid plans if you need higher limits and more features. Pando is a free file sharing software that makes downloading, streaming and sharing large files and folders (up to 1GB) fast and easy, using a managed Peer-to-Peer (P2P) technology that they designed. It allows you to send large files and folders using any email and no registration is required. Pando bypasses email attachment limits with small .pando attachments and never clogs your inbox. You can also share directly to IM, Facebook, or Twitter and post downloadable videos and photos by embedding Pando Packages on any website, including MySpace, Facebook, Blogger, WordPress, Typepad, Xanga and LiveJournal. Share files and folders (up to 1GB) with others using any IM client, such as Google Talk and Skype. 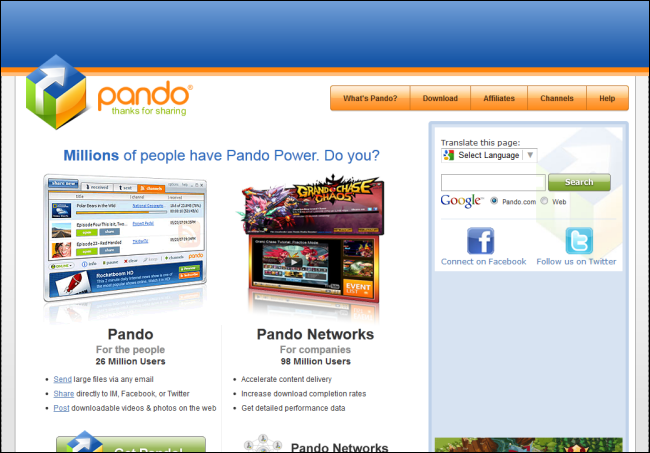 Simply create a Pando link, paste it into an IM and get offline. Your recipient just clicks the link to get what you sent. 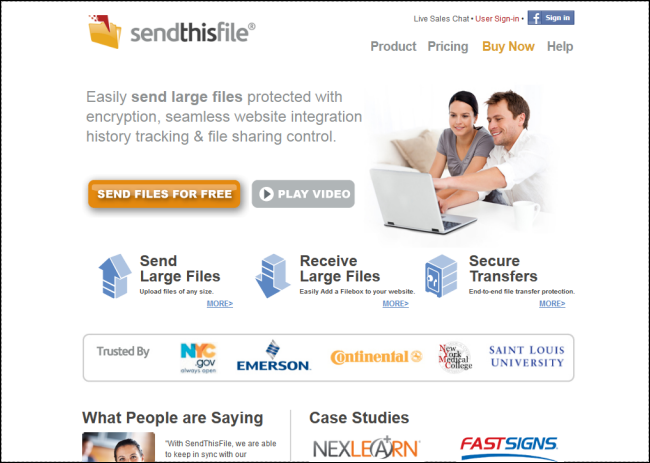 SendThisFile is a robust file transfer service that harnesses the power of the Internet to modernize and simplify sending and receiving large files. It provides you with simple and fast file transfers, keeping complexity at bay with our easy to use file upload pages where you can monitor your progress. All transfers include SendThisFile’s comprehensive encryption and security, creating end-to-end 128-bit encrypted file transfers without having to configure a single setting. The free account allows you to send files with a maximum size of 2GB to one recipient at a time. The files are available to download for three days, and the transfers are secure, using 128-bit SSL. You can also use their FileBox to get photos from your friends and family. They also have paid accounts that provide higher limits and additional features. 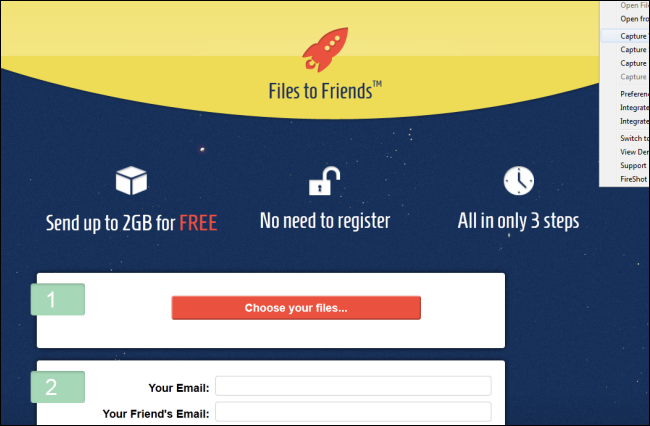 Files to Friends is a very simple website that allows you to send up to 2GB to friends and family in three steps, without the need to register. JustBeamIt is a beta service that makes transferring files very easy. 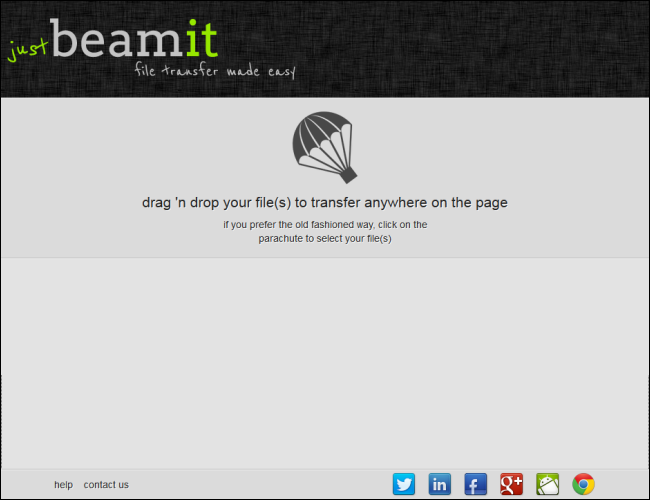 Simply drag your files into the drop zone, which is the area under the header with the parachute. You can also select your files by clicking on the parachute. Then, click the Create Link button to generate a unique download link to share with the recipient of your files. Once the file is uploaded, a “waiting” indicator displays, until the recipient connects to the page and downloads the file. The only drawback of this method is that you, as the sender, cannot leave the page until the download is complete. Once you and your recipient both leave the page, the transfer link becomes useless. If the recipient encounters a problem with the file, you’ll have to start the process over again. The next two items are not specifically for sharing photos, but we thought they would be useful. One item is a website that allows you to share large amounts of text and the other is a free tool that allows you to split large files to make them easier to email or share. 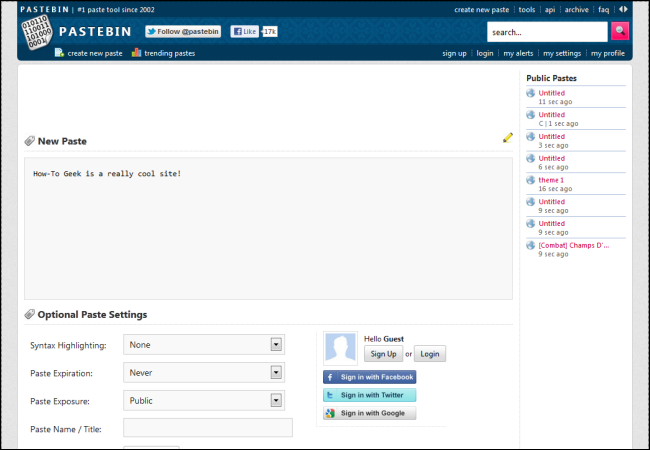 Pastebin is a free web service wherein you can paste text to share with your friends, family, or even your colleagues, and keep it there for a certain period of time. Also, you can choose for how long the particular post should remain, because after the specified time period that post automatically gets deleted. You can also choose to keep your paste public or private. The private pastings are visible only to the people you choose to share your links with. This can all be done for free, without a need to download or install any software. They also offer a program called Pastebin Desktop, which allows you to take full advantage of your Pastebin.com account directly from your desktop. The program puts an icon in your system tray that lets you access the full application. GSplit is a free reliable file splitter program for Windows that lets you split your large files (bigger than 4GB), such as self-extracting archives, Zip archives, disk images, photos, music, video, and backup files, into a set of smaller files called pieces. These pieces are easier to send by email (forget attached file size restrictions imposed by some ISP, pop3, SMTP and other e-mail servers) and upload to host accounts, file delivery services, and online file hosting sites that have restrictions on file sizes, and share with friends, colleagues or other users through networks and the Internet. You can choose to split files in one of two ways: disk spanned (split into a set of files varying in size auto-calculated by GSplit based on available free disk space and saved immediately to spannable removable disks) or blocked (split into a set of same sized split files). The files pieces can also be made self-uniting. To do this, GSplit creates a small stand-alone executable file that will put all of the pieces back together. This executable provides your users with an intuitive Windows interface whose appearance can be customized according to your needs. Thus, GSplit is not required in order to restore the split file. You can also store file properties like file dates and attributes, and restore them. GSplit also provides the ability to perform fast checks (size, offset, CRC32) in order to detect file corruption and to give you the assurance that your files are successfully restored by your users. When a piece is corrupted, you are notified about it, so you just need to get a new copy of that piece, not the whole set. A portable edition of GSplit is also available with no required installation. Run the portable file splitter directly from any removable disk like a USB flash drive. Settings are also saved directly on the storage media, not on the computer. Use uTorrent as a simple tracker to share files privately. Use a service called AirDropper to allow others to send files via email securely using Dropbox. Use Gmail’s new increased Google Drive integration to be able eliminate the 25MB in-email attachment limit and send files up to 10GB. Use 7-Zip to shrink and/or split files so they can be easily posted to sites like SkyDrive or Dropbox or sent through email. If you have found any other useful websites or tools that allow you to send or share large files, let us know.